How CC` formula is written? The lengths of the two parallel sides of an isosceles trapezium are 20 cm and 28 cm and the lengths of each of the non parallel sides is 5 cm. What is the distance between the parallel sides of the trapezium? Last edited by skipjack; April 9th, 2018 at 08:02 AM. Reason: correct 25 to be 28. 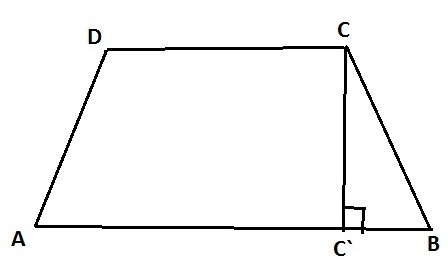 Draw the corresponding DD' perpendicular to AB from D. That divides the trapezoid into two right triangles and one rectangle. By "symmetry" (equivalently using triangle congruence theorems) the two triangles are congruent and length CC' is the same as length DD'. Length AB is 28 and Length CD is 20. So what are the lengths of AD' and BC' (which are equal? Lengths AD and BC are given as 5. Use the Pythagorean theorem to find length CC'. Do you want to know how it's written or how it's proved? Let's assume that AB > CD, as in the diagram. By the symmetry of the isosceles trapezium, BC` = AB/2 - CD/2. By Pythagoras, CC`² + BC`² = BC².